What a lovely class that was ! Karen Norquay is third from left. Shona is on extreme right. Looking at the picture I notice that Lyndon (Sinclair) isn't in it, so must have been off that day. 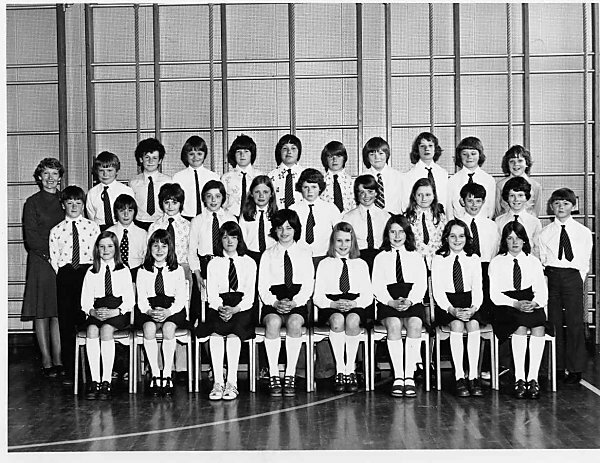 i notice that in this picture (middle 5 from the left) that there is a girl called Karen Logie and i too have this name i find it extremely interesting to know that somebody else shares this name as logie is an unusual surname. kevin peddie, please get in touch on wuodgem@mailcity.com. I'd really like to contact Inga Winn - we knew each other when I was at University. Does anybody have contact details? Does anybody know where Andy Cole is ? Alyson Wilson (Smyth): Inga Winn is now Inga Masterson and she is my mother.